Enjoy the benefits of both Infrared AND Himalayan Salt Therapy! Our bodies have become virtual dumping grounds for hundreds of thousands of toxic compounds that invade our air, water and even the soil in which our food grows. Today more than 77,000 chemicals are in active production in this country, and more than 3,000 chemicals are in our food supply. The EPA estimates that our bodies cannot metabolize over 20,000 of these chemicals. So what happens to them? These toxic substances are stored in fat cells throughout our bodies where they continue to accumulate. In fact, studies indicate that most of us have between 400 and 800 chemical residues stored in the fat cells of our bodies. Together, these chemicals and heavy metals create a situation of chronic toxic overload. As these toxins build up, they can cause enzyme dysfunction and nutritional deficiencies, create hormonal imbalances, and can lead to other debilitating chronic illnesses. How do Infrared Sauna’s work? The sauna duplicates these healthy infrared frequencies. The tissues selectively absorb these rays as the water in the cell reacts in a process called “resonant absorption.” This resonant absorption occurs when the frequency of the infrared matches the frequency of the water in the cell causing toxins to be dropped off into the blood stream and excreted in sweat, feces and urine. Enhanced Immune Health: Each infrared sauna session causes a brief, beneficial increase in body temperature, which improves immune health by boosting production of infection-fighting white blood cells and killer T-cells. Stress Relief: High daily stress levels put constant strain on the body’s nervous system and can contribute to chronic disease. The infrared sauna helps to reduce physical stress by boosting circulation and triggering the production of endorphins, the “feel good” hormones. Weight and Cellulite Control: Toxins can play a significant role in preventing us from losing weight as well as gaining weight. Those wishing to lose weight should note that the cardiovascular effect from a single sauna session burns as many as 600 calories. The infrared sauna is also quite effective at dealing with cellulite when combined with massage therapy and nutrition. – Hydrate your body before using our far infrared sauna. – Please don’t come on an empty stomach. Have a light meal prior to your session. You also do not want to be full as your body will focus on digesting the food versus detoxing. – Do not take your cell phone into the sauna. – We will supply 2 towels. One to sit on in the sauna and one that you may use to dry off or/and cool down after the sauna. Your feet will be resting on Himalayan salt. – Our Infrared Sauna is suitable for two people, so bring your spouse, friend or relative and enjoy the health benefits of detoxification while you relax and listen to soothing music. – For pain relief we recommend visits 2-4 times per month. For Detoxification or Chronic issues, we recommend you schedule for 1-3 visits per week. 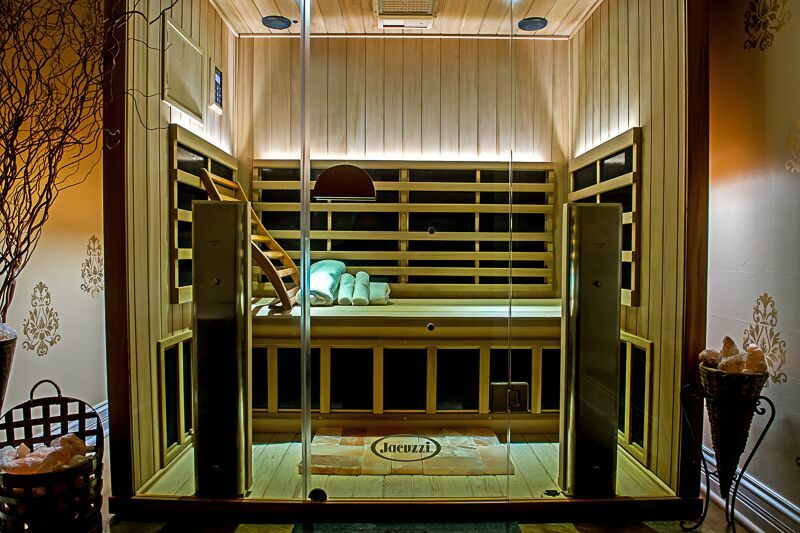 Our sauna uses six ceramic heaters that produce energy on the narrow far infrared end of the electromagnetic radiation spectrum. Traditional saunas heat the body by heating the air, while far infrared waves heat the body with radiant energy, warming the body on the inside as well as on the surface. Radiant heat like this is similar to the heat from the sun, without the sun’s harmful UV rays. Our bodies both emit and absorb infrared radiant energy, and with the Heavenly Heat Sauna, far infrared energy penetrates into the body approximately 1.5 inches. As a result, the sauna is effective at temperatures lower than those of traditional saunas and is more comfortable for most people. In our sauna, the therapeutic operating temperature is much cooler: 130 degrees Fahrenheit compared to 150-210 degrees Fahrenheit required by a traditional sauna. Infrared saunas help induce up to three times the sweat volume of traditional saunas and is thought to be seven times more effective at detoxifying metals such as mercury and aluminum, as well as cholesterols, nicotine, alcohol, ammonia, sulfuric acid, and other environmental toxins when compared to conventional heat or steam saunas. 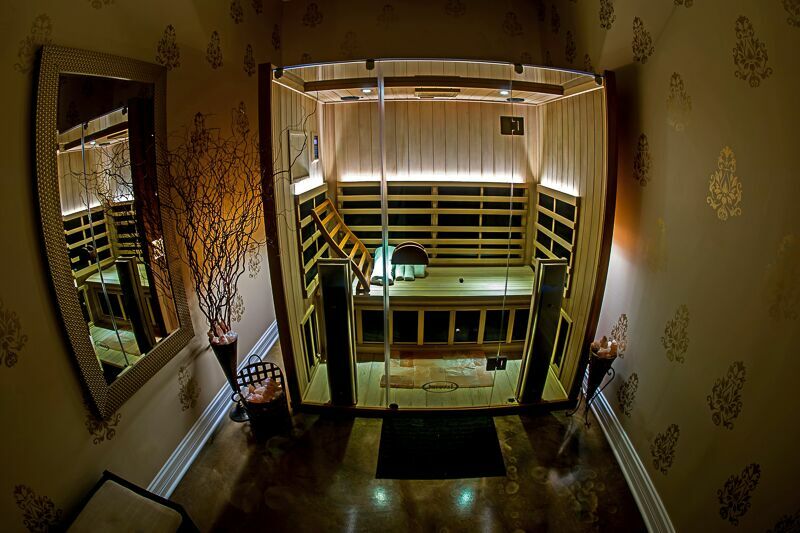 We have a 2-hour cancellation policy for our Infrared Sauna. If you do not cancel 2 hours prior to your scheduled appointment, you will be charged with a single session from your package. Please note, we cannot always guarantee the temperature in the sauna. Each client has a right to a comfortable temperature for their session. We will set the sauna to your desired temperature for your specific session, however if the previous client wishes to have the temperature lower than your request, we cannot guarantee your session will start at your desired temperature. If you choose to not attend your session because of temperature, you will be charged with a single session from your package.